Be the first to share your favorite memory, photo or story of R. William. This memorial page is dedicated for family, friends and future generations to celebrate the life of their loved one. 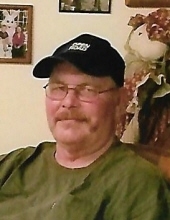 William “Bill” Shute, 61, of rural Ottawa, passed away on Saturday, April 13, 2019 at Missouri Baptist Medical Center in St. Louis, MO. Funeral services will be at 11 a.m. on Friday, April 19, 2019 at the Mueller Funeral Home in Ottawa, with Rev. Cheri Stewart, Pastor of First United Methodist Church, officiating. Burial will follow at Deer Park Cemetery. Visitation will be from 9 to 11 a.m. on Friday, at the funeral home. Bill was born on July 13, 1957 in Ottawa to Richard and Joan (Fox) Shute. He was a 1975 graduate of Ottawa Township High School and attended the Milwaukee School of Engineering. He enjoyed being an outdoor sportsman, riding his 4-wheeler, watching WWE wrestling and football, and enjoyed his family being around him. He is survived by his wife, Mary (Janke) Shute, 3 children, Nick (Rachel) Shute, Andy (Zita) Shute, and Jenifer Shute, 3 step children, Tom (Jen) McCague, Shaun (Alecia) McCague, and Rachel (Brad) McCague,19 grandchildren, and 2 brothers Jim (Nancy) Shute and Larry (Tina) Shute. He was preceded in death by his parents, a brother Glenn. Pallbearers will be Tom, Shaun, and Kaleb McCague and Nick, Andy, and Danny Shute. Memorials may be directed to the family for charities to be determined. To send flowers or a remembrance gift to the family of R. William "Bill" Shute, please visit our Tribute Store. "Email Address" would like to share the life celebration of R. William "Bill" Shute. Click on the "link" to go to share a favorite memory or leave a condolence message for the family.